Loving Long Island Newsletter #17 - Count the Alewives! Ah, Spring is finally here. The prediction I made in the last issue came true and we did indeed make it through March without any snow. Thank God for that! This month, April, brings to Long Island the annual migrations of over 50 different kinds of birds. We learn about this as kids and expect it every year. Even if you're not a bird watcher, you know that birds fly south for the winter, and come back in the spring. But I'd like to tell you about a different kind of migration that I bet most Long Islanders know very little about.This is the time of year that "river herring" return from the Atlantic Ocean to the stream or river where they were born to spawn. Everyone knows that salmon do this and we've all seen them jumping upstream to the spawning grounds while bears try to catch them for dinner. The same thing is happening on Long Island right now except without the bears. 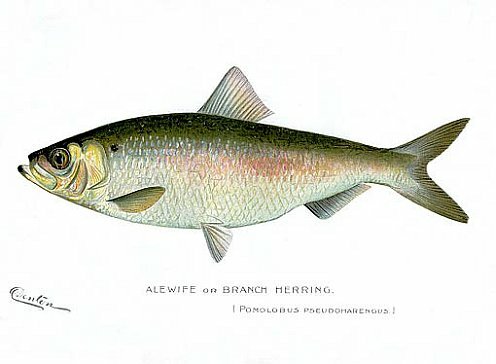 There are several different kinds of river herring, but the one I'm talking about is the Alewife, named in the 1630's for its large abdomen and resemblance to the portly female tavernkeepers of the day. 1898 print of an Alewife by artist S. F. Denton courtesy of Classic Nature Prints. These fish are caught and sold for bait and human consumption (smoked and mostly down south) and along the east cost of the United States represent a multi-million dollar industry. They aren't harvested much on Long Island, but we do count them as they migrate up stream to spawn. And that's the important part of this month's newsletter. Many of the small streams that they use to get to the spawning grounds have been destroyed or blocked resulting in reduced alewife populations. As a result alewive's have become a species of concern, meaning they're not threatened or endangered yet, but they are headed in that direction. Fortunately, there is some effort being made to restore the spawning grounds on Long Island and the waterways that lead to them. Part of this restoration process is the annual Long Island Alewife Survey. During the survey the fish are counted as they swim upstream. Volunteers are needed to help count the alewives and if you're interested in participating here is more information about the 2012 Alewife Survey and how to participate.